In a small saucepan, infuse the milk, with the herbs, onion and garlic on a moderate heat. In another saucepan make a roux by melting 50 g butter, then adding the plain flour and stirring continuously until it starts to thicken. Once the milk has infused with the herbs for about 15 minutes, strain it into another pan on a low heat. Add the roux to the infused milk whisking continuously until it thickens and coats the back of a spoon. Add feta and continue to whisk until smooth. In a small bowl, combine corn flour with the water to make a slurry. Add slurry to the béchamel and stir until it reaches a sauce like consistency. Allow to cool. To make the dressing, combine grapes, shallots, ketchup, sherry vinegar and olive oil in a small mixing bowl. Refrigerate until required. 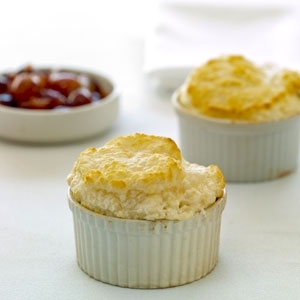 Brush each soufflé mould with softened butter, and then dust the inside with breadcrumbs. Whisk egg whites to firm peaks, and then gently fold in the feta mixture until combined. Add soufflé mix to each mould, remembering to clean the tip of the rim with your thumb, to allow it to rise evenly whilst cooking. Bake for 8 mins approx. Serve immediately with the grape dressing on the side. This pasta is just as tasty the next day - if there are any left overs, that is!